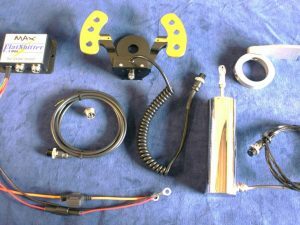 Very briefly this kit enables you to do full or part throttle clutchless up gearshifts AND auto throttle blipped clutchless downshifts, SIMPLY AWESOME!!! Designed to help riders/ drivers maximise their acceleration on the circuit by enabling clutchless upshifts with the throttle fully open not forgetting clutchless downshifts. THE ULTIMATE RACE ROAD & TRACK DAY QUICKSHIFTER SYSTEM-SEAMLESS SHIFT. CLUTCH-LESS UP & DOWN GEAR SHIFTS. THE NO 1 CHOICE FOR BIKE ENGINED KIT, RACE CARS & MOTORCYCLES. SO WHAT DOES THE EXPERT BUMP & BLIP SYSTEM DO? It’s a pro-shifting device which temporarily cuts the fuel or ignition spark to the engine which unloads the gearbox allowing you to shift gear when upshifting without coming off the throttle or using the clutch at any engine speed, this reduces the gear shift time, making you much quicker on the track. This unique pro-shift bump & blip, system also enables clutchless downshifts (up-to 4 in 1 second) !! Although the obvious advantage of a seamless gearbox is time saved during acceleration, the shorter, smoother shifts also make the vehicle much more stable – especially beneficial when accelerating out of corners. When driving a race/ kit car with a sequential gearbox, it will only take you a very short time to realise that the slowest part of changing gears is the driver! Upshifts without using the clutch are do-able with practice but difficult to get right each & every time, but once you really start trying to push the speed of the shifts, most people find it’s very difficult to get the timing of lifting the throttle, changing gear and reapplying the throttle at just the right time. If you don’t lift of the throttle enough, the gearbox dogs won`t unlock and the gearbox will not shift, lift too much and for too long and the car will start engine braking, and once again the gearbox dogs lock and the shift will not happen. REMEMBER THE SLOWEST PART OF GEAR-SHIFTING IS THE DRIVER! ALL FLATSHIFTER PRODUCTS ARE DESIGNED AND MANUFACTURED IN ENGLAND. Lap Times: You can expect a distance gain of at least 1 meter per full throttle up-shift. For example, 15 gear shifts per lap over a 20 lap race will add up to quite a substantial advantage over your competitors or time sheets. clutchless downshifts up to 4 in 1-second lead to shorter braking distances, you keep 2 hands on the steering wheel enabling reduced lap times. The soft-restore feature is a totally unique user-friendly method of providing the optimum up-shift kill-time without having the complexity or necessity or added expense of having individual kill-times for each gear, Soft-restore gives smooth up-shifts at all revs and speeds with close or wide ratio gearboxes. This is achieved with our unique shift control software that unloads the gearbox by cutting ignition or fuel supply voltage abruptly and then smoothly and progressively restoring the power simulating progressive throttle opening. Max kit and Expert kit , the ultimate combination. Clutch-less downshifts, left foot brake instead of using the clutch keeps your suspension level through corners for faster corner exit. Longer clutch & chain life, & transmission from much smoother shifting ie not keep coming on /of the throttle and clutch. Concentration! With fewer things to think about while driving it enables you to concentrate more on lines, braking points and your competitors, etc. which gives quicker lap times. Paddles allow gear changes to be made quickly with less effort. With full throttle clutchless shifts both hands are kept on the wheel, eyes concentrating on the road ahead. Smoother less jerky shifts with less chance of unsettling your car ie breaking traction when cornering in wet and dry conditions. NEW unique H pattern gearbox clutchless downshifts now possible !!!! see video Lotus Elise GT Widebody – Honda iVTEC K24 / Blipshift Test below. Flatshifter had been producing the highly acclaimed and unique Flatshifter Pro system (The Ultimate Race Quickshifter System) for many years, when we were contacted by one of the worlds largest and well known Italian race suit and motorsport accessories & race car designers/ manufacturers to design and manufacture a race-specific sequential shifter kit version of the Flatshifter Pro system. After many weeks of track testing and liaising with the professional F3 race drivers the final set up and specification of the Expert quick-shifter/ sequential shifter kit was devised and raced with amazing results. See the feedback page for some of the lap record-breaking championship winning videos and customers feedback letters. The Flatshifter Expert does not require individual gear kill times the system’s soft-restore feature is a totally unique user-friendly method of providing the optimum up shift kill-time for each gear without having the complexity of using a laptop computer and all the trial and error involved to set up individual kill-times as with inferior outdated sequential quick-shifter systems. Soft-restore gives smooth up-shifts at all revs and speeds with close or wide ratio gearboxes. This is achieved with shift control software that unloads the gearbox by cutting ignition or fuel supply voltage abruptly and then smoothly and progressively restoring the power simulating progressive throttle opening. This allows a kill-time window to suit all gear ratios without the penalty of transmission shock loads caused by long kill-times required for lower gears which cause transmission damage and loss of traction. There is also far less chance of breaking traction when shifting mid corner or on wet & slippery corners not forgetting far less chance of mechanical failure and wear, the best quick-shifter kit bar none. Flatshifter kits available for just about every make and model of motorcycle engine`s & most other sequentially equipped race cars, including those fitted with: Carburetors, Slide carburetors, Jenvey & radical throttle bodies, fuel injection, turbocharged & supercharged engines and can cut the ignition or fuel injection, in fact you name it we can probably do it !!! Auto self-regulating throttle Blip for downshifts. A Computer is not required to set up or any adjustments. Individual gear kill times not required with unique soft restore feature. The Flatshifter Expert system can be used in conjunction with power commanders fitted to engines that have 4 or 8 injectors. AND no Expansion Module required. compatible with all aftermarket fueling management system such as Power Commanders & all makes of engine ecu. Although the obvious advantage of a seamless gearbox is time saved during acceleration, the shorter, Flatshifters smoother shifts also make the motorcycle or car more stable – which is especially beneficial when accelerating out of corners. Adjustable ignition cut Timing. (the kindest method) or fuel injection cut if required. Soft Power Restore for Smooth Gear Changes. Original clutch use retained & not affected. Worth at least 1 meter per up-shift. Fitted as standard equipment by manufacturers worldwide. 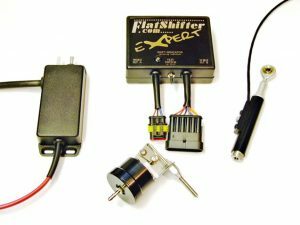 The Flatshifter Expert is transportable, meaning you can use it on many different machines. The Expert system is not tied to any ECU “box”, so you can re-use your investment over and over! Multiple bikes, changing bikes or engines during the season or buying a new machine means you can bring your Flatshifter Quickshifter system with you for very little or no added expense. Flatshifter STAND ALONE quick-shifter systems, designed to cut the ignition side of the engine as atop end quick-shifter should do. No interface problems with your engine`s ECU’s, no software problems. when we kill from the ignition side of the engine, there is no “extended” fuel burning, from the secondary injectors fitted to most modern bike engines that are not being closed off. The difference between winning and losing is very small can you afford to just give away that difference. To gain the proven performance advantages of adding an Expert system would cost many, many times the purchase cost by going the engine tuning route, and without the increased reliability issues engine tuning will bring. All Flatshifter products are repairable, most of our competitors products are made in China etc and are totally sealed so that when you get a problem after the warranty has expired you have to Throw it away and pay for another complete unit, ALL FLATSHIFTER PRODUCTS are repairable so in the unlikely event of a problem or damage after the full 12 month guarantee has expired you can return the unit to us for any repairs or updates. I’ve had a look at some of my data and, on my 1585cc Pro-sport, the acceleration curve is smoother with the Flatshifter than with totally manual up-shifts (I am naturally a pretty rapid gear changer and in my old K engined Catering van with a 9.5k rpm soft cut and an H shift, most spectators believed that I had a bike engine and sequential ‘box) and saves around 0.4 secs over 2 x 250 m flat out acceleration zones. But, the real time savings come under braking. With the Flatshifter I was able to stay on full throttle then, with no cruise period, concentrate my right foot on a total “doom” brake into the bend, only having to modulate braking effort to avoid locking and maintain Tyre loading (see Milliken and Milliken’s “Race Car Dynamics” if you want to explore the theory further). We ran our new LCR sidecar on the weekend that I fitted the Flatshifter Expert to. It`s terrific! Only a slight adjustment needed & all is good. We dropped 1.3 seconds off our previous best time at the same track earlier this year. I’m very happy with the way it works. Thanks, Duncan Rogers Sidecar 55. Am I happy? Yes ecstatic. Had a great deal of fun today with the Flatshifter Expert & Max combination and can’t wait to try it out on a track day. That said, this combo is equally happy on the road, fast or slow and makes everyday driving so much easier in a BEC or Bike engined car. LATEST CUSTOMER FEEDBACK LETTER BELOW. We have very successfully run an early version of the quick-shifter/Flatshifter gear-change system for the last 10 years on an OMS Sprint car, and having studied all of the available makes and types of systems for a lightweight motorcycle engined single seater for the new car we have constructed for this seasons racing, I decided to use the latest version the Flatshifter Expert This system is a very well engineered yet simple system, easy to install and set up, a real ” Plug and Play” in modern terminology. I became very aware of the over complicated and programmer reliant systems made by other manufacturers, and of course, the significant price differences Flatshifter Expert, Max system & paddles seamless clutch shift system when these systems require replacement ECUs and other major components. 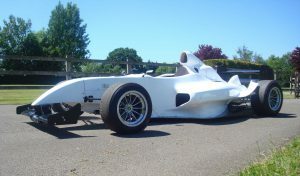 Having installed the Flatshifter Expert to a Gen2 Hayabusa, with the Flatshifter electronic paddle shift, we have now run the car in two events, both without any faults in the system and winning FTD at Goodwood in only our second time out. I continue to be totally impressed by this system and fully recommend it to others. (FTD = (Fastest time of the day)FRANK CATT – WEALDEN ENGINEERING DEVELOPMENTS. Update; 2 x 1st places 2 x second & 1 third from 1st 5 events !! FLATSHIFTER EXPERT, ONLY £799.00 GBP + V.A.T & postage , ( VAT EU countries only) SIMPLY AWESOME!!! (EU COUNTRIES ONLY) PLEASE CONTACT US FOR COURIER COSTS. NEW DEALERS WANTED FOR FLATSHIFTER’S UNIQUE QUICKSHIFTER PRODUCTS. FLATSHIFTER SECOND TO NONE ESPECIALLY YOUR COMPETITORS!